Celebrity is a funny thing. One minute you’re in, the next out–or controversial like Madonna, who’s both versatile and successful. But could she be too successful? Well, the bloodhounds in the press are always ready for the kill. God forbidyou should be out of fashion when you’ve been versatile and successful in your lifetime, like film director George Stevens (1904-1975). And though it may sound snobbish to say so,Stevens hasalways been loved by both the cognoscenti–James Agee was a great admirer–and the public, though that public, as well as critics, like Andrew Sarris and David Thomson,have sometimes failed to get the picture. Sarris, who’s the prophet of the auteur theory in America, relegated Stevens to a lower place in his pantheon in his 1968 book The American Cinema, consigning him, as it were, to a lower circle of hell. And though it is said that Sarris has since recanted, the lock-step response–"Stevens’ later pictures are big and empty" — has stuck. And weren’t they made in the oh-so-conformist 1950’s and therefore not worth our trouble? Marilyn Ann Moss’ critical biography, Giant, corrects that misperception. She also proves beyond the shadow of a doubt that it was neither coincidence nor mere luck that brought Stevens Best Director Oscars for A Place in the Sun (1951) and Shane (1953),four Director’s Guild Of America Awards, including the D.W. Griffith, as well as many other honors. Moss’book couldn’t be more timely. 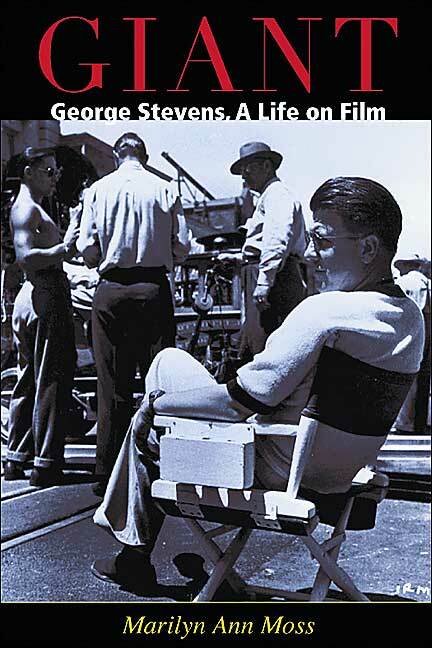 2004 was Stevens’ centennial year and was celebrated with screeningsby The Academy of MotionPicture Arts and Sciences, London’s British Film Institute and the Academy in conjunction with the Foundation for National Archives in Washington, D.C.
Donald Richie’s 1984 book, George Stevens : An American Romantic, though well written, is close, but nocigar. Moss’work isfar more extensive and draws on the huge George Stevens Collection at the Academy’s Beverly Hills Library. Shebalances her findings there with comments from many of the director’s friends and provides penetrating insights of her own. A man who directed such divergent film classics as Gunga Din (1939), Alice Adams (1935), Woman of the Year (1942) and the Astaire-Rogers Swing Time (1935) is obviously a hard man to pin down. Yet Moss manages to getbeneath the surface of Stevens and his legend. She also succeeds in her intention of placinghim "squarely where he belongs: in the center of thealways lively history and the culture of the American cinema." Stevens’ involvement with movies began in the silents, or as Moss puts it, his birthday,December 18, 1904, in Oakland,California,"predated by only months the opening of the first nickelodeon in the United States, inPittsburgh, Pennsylvania, in 1905." Stevens’ family seemed to propel him helplessly into pictures. His parents were actors who acted in and ran their own theatre company which performed in the Bay Area; they also did the vaudeville circuit up and down thecoast, as well as theclassics. Moss finds that the ever observant Stevenssoaked up everything–how plays were built and why audiences responded the way they did. And so when he and his brother Jack and hisparentsabandoned live theatre andmoved south to find work in Hollywood in 1922, he was ready, willing, and able to absorb and master this new form. Stevens quickly advanced. From a cameraman and director at Hal Roach Studios he graduated to shorts at RKO in 1933,to features the next year at RKO and Universal. But his work as a cameraman for Laurel and Hardy silents and talkies was clearly seminal and Stevens’ s own cinema took root. A heightened attention to the nuances of human behavior becamethe hallmark of Stevens’work as a truly humanistdirector. It’s there in his comedies–Hepburn’s ineptitude inmaking breakfast forSpencer Tracy in Woman of the Year, the comic yet touching interplay between JeanArthur, Joel McCrea and CharlesCoburn in The More the Merrier (1943), and certainly in the somber, deeply personal films he made when he came back from his service with his Signal Corps camera unit during World War II, during which he shot extremes of joy–the liberation of Paris–and sorrow–the liberation of Dachau. These images never left him, even when he came home to form Liberty Films with fellow directors Frank Capra and William Wyler. Stevens’ first wife, Yvonne, remembers that "he was a very sensitiveman. He just never dreamed, I’m sure,what he was getting into when he enlisted." Or, as Stevens writes in a 1945 letter to her, "If it hadn’t been for your letters… there would have been nothing to think cheerfully about, because you know thatI find much[of] this difficult to believe in fundamentally." Though the war continued to haunt Stevens, he still believed that his films could say, indeed must say, something of value. His first postwar film, I Remember Mama (1948),presents human behavior in an entirely personal way, and it’s tempting to read its story of a Norwegian immigrant family struggling to come to terms with 1910 San Francisco as somehow mirroring Stevens’own family experience when they moved to Los Angeles. Everyone, at any rate, copes hard and feels like an outsider.Moss shows how thesefeelings deepened in his subsequent work.Themain players in A Place in the Sunare out of sorts, even shell-shocked. Elizabeth Taylor’s Angela Vickers (thespoiled rich girl), Montgomery Clift’s George Eastman (her poor relation) and Shelley Winters’ Alice Tripp (the poor girl he falls in love with and gets pregnant). Stevens’ penchant for the outsider continuedin Shane. Alan Ladd’s savior gunman is certainlyone, but so are the Starrettswhom he defends. And in Giant almost everyone is an outsider whethertheyknow it or not, from MercedesMcCambridge’s tough-as-nails Luz Benedict to James Dean’s JettRink. Rock Hudson’s Bick Benedict becomes anoutsider when he begins to accept the depicted discrimination against Latinos and he is cherished by Elizabeth Taylor’s Leslie Benedict for doing so. And who could be more of an outsider than the trapped Otto Frank family and their Secret Annex sharers in The Diary of Anne Frank (1959)–Hollywood’s first confrontation with the horrible reality of the Holocaust–who can only see the world from a window? And then there’s thebiggest outsider of them all, Max von Sydow’s Jesus in The Greatest Story Ever Told (1965). Stevens’ Christ is subtle, complex, and unknowable. He portrays a Messiah who craves solitude, is loath to do what people want–perform miracles–and when he does, wants to escape back into solitude–majestic, troubled, and lonely. Moss’ readings of thesepostwar pictures can run deep. But she misses theboat on this one, preferring, for the mostpart, to accept the standard version ofits filming–the lengthy gestation period, famously difficult production, script rewrites, multiple takes,too-beautiful-to-be-true look,and the often thoughtless and mostly inimicalcritical and public reception. Moss sees vastness where she thinks intimacy should be, missing the point that the film’s vastness is in fact itsintimate, almost Gnostic meaning,and that Stevens’ script, though it draws on the three Synoptics and other ancient and modern sources, leans heavily on thegospel attributed to Johnwhich stressesthe quiet, interior relation betweenthe self and things beyond its knowing.This is afamously misunderstood film which needs tobe seen and appreciated formany things, not least of which is Stevens’ mastery of his medium. The dissolves and highly emotive use of sound in A Place in the Sun andAnne Frank reach their apogee here. Stevens constitutes a vast, nearly impossible subject and it’s to Moss’ supreme credit that she gets so much of whatmakes him unique. Though often described as a romantic, he was far too complicated for such simplistic labeling. His films are emotional, but in a good,Buddhist way. Paying attention tothe moment pays dividends: you begin to understand. And what could be more necessary in these quick, slick, and definitely all too distracted times?